There are two types of movie suspense. The first is cinematic suspense which is simply designed to keep the audience interested in the picture. All movies, regardless of genre, use this brand of suspense. The second is fearful suspense. This is the type of suspense only used to induce fright. Hammer horror has traditionally used cinematic suspense, and does so quite masterfully. It keeps our eyes glued to the screen, however few actually find their movies actually scary, nor are they really intended to be scary in the traditional sense of the word. This is why Taste of Fear (released as Scream of Fear in the United States) is so significant to the Hammer repertoire. Not only is it one of the most concise movies Hammer Studios ever made, but it is one of the very few that offers significant fearful suspense taken right out of the book of Hitchcock. Penny Appleby is a young girl who is confined to a wheelchair. Soon after she is sent home to live with her stepmother, she starts seeing her father’s corpse around the premises. Despite the fact that she is convinced the visions are real, her stepfamily believes she is going crazy. You could probably name off half a dozen classic horror movies that have this exact story, but Taste of Fear’s strength is not the creativity of the plot but rather the way the plot is told. This is mostly due to the fact that it was written by Jimmy Sangster, one of Hammer’s very best writers. Sangster has a very impressive writing resume, but his true talent was writing psychological thrillers instead of monster-laden horror, as shown by his arguably best work, Nightmare. While Taste of Fear was not as cutting-edge as Nightmare, it was certainly well above most thrillers of the age. I couldn’t really find a low point in the script as Sangster masterfully taunts your mind leading you off on tangents until he brings you to the surprising end. He is extremely skilled at making you believe one thing while going somewhere else entirely, all while staying remarkable coherent. This is why the ultimate ending is completely unpredictable despite the fact that there are subtle clues throughout the script. Finally, Sangster’s main writing strength is that he uses the weaknesses of his characters to draw the suspense. In this film, Penny’s disabilities (both physical and also her emotional disabilities as she is alluded to be a neurotic) propel the suspense, which makes the events that happen to her are all that more damning. But the best writer doesn’t get far without a great director, and Seth Holt proved to be up to the task. In these ages of computerized technology and “jump out at you scares,” the method of “slowly graduating creepiness” has all but been lost. But while modern techniques get tired very quickly (especially to us true horror fans), primal fear never gets old. And this is what Taste of Fear taps into. The scenes where the corpses appear are absolutely crap-inducing, mostly because Holt takes his sweet time in drawing you into the scene, slowly but relentlessly building the suspense. It’s the primordial Hitchcock formula at its finest, and for this reason, Taste of Fear is far more effective than most of its modern counterparts. “Jump out at you scares” have their time and place, but they are quick shots of adrenaline and moments later you are back to normal. But a director who can keep your adrenaline pumping for long stretches at a time will, by default, be much more intriguing. I’ve talked to many people who have said that they saw this movie when they were little and found it just as scary now as it was then. With all due respect, I don’t think anyone will be saying that about I Know What You Did Last Summer. And finally, if the fact that this movie may make you soil yourself isn’t intriguing enough, we get treated to a very young Christopher Lee! And he’s playing a role somewhat uncharacteristic for him, which was nice to see, but this is one of the few Hammer Films in which he didn’t completely make the film. And this is definitely not a detriment to him, but compliment to the film. No actor should have to make a movie, regardless how great he/she should be. Taste of Fear understands this. It is definitely nice to see him, and he does a fine job as always, but this movie is strong enough to completely stand on its own without the help of Hammer Horror Stars. Fine compliments indeed. Taste of Fear is a true high point in Hammer horror. It’s not the easiest to find, but not impossible either. 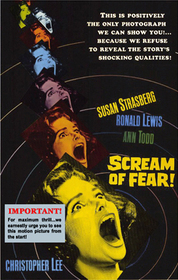 Videoscreams (www.videoscreams.com) has a VHS copy for $11 (under the American title, Scream of Fear). A required movie for fans of Hitchcock suspense, Hammer, or classic horror in general, Taste of Fear may just might end up being the best fright you have this month. Submitted by Pretty Polly (not verified) on Thu, 2010-10-28 14:27. I am glad to have found this well and thoughtfully written review. I am not a fan of "jump.-at-you" horror AT ALL - which is why I love Hitchcock (and why I consider his "Rebecca" to be far superior as a thriller than most of the "cult" horror or thriller movies that came later). Man, this IS one scary film! Submitted by félix (not verified) on Mon, 2011-07-11 16:26.